The image has already been seen countless times around the world. Observer Research Foundation Chairman Sudheendra Kulkarni sitting with his face blackened with ink next to former Pakistan Foreign Minister Khurshid Mehmood Kasuri at the latter’s book launch in Mumabai. Kulkarni suffered the attack by hyper-nationalist Shiv Sena thugs who were against the Pakistani book event being held in India. While the world was shocked by the image, there were many here in Pakistan who jumped at the opportunity to advance a hyper-nationalistic narrative of their own. 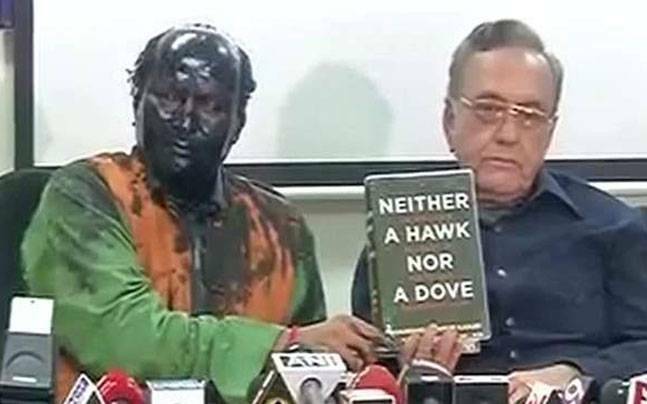 The image of Sudheendra Kulkarni’s blackened face is a humiliation for India, but it should also be a chilling warning for us in Pakistan also. Have we forgotten about the campaigns to ban Indian media within our borders? What about the fact that not only Indian media, but even Malala’s book launch was also canceled due to security threats. Some books never even see the light of day in this country if they are deemed against the national interest, even when they are written by a former DG-ISI! Most telling, though, our own hyper-nationalists give the exact same message as Shiv Sena to ban Pakistanis from holding book events in India in the first place. This is the true blackened face of hyper-nationalism. It is not really about promoting or protecting the country you love. It is about gaining power through threats and intimidation. It is about oppressing your own people to build your own illegitimate power over them even more than punishing anyone else. Foreign threats? These are just a convenient bogey for hyper-nationalist keyboard warriors. Shiv Sena in India and groups like Difa-e-Pakistan here are two sides of the same coin. They shout about foreign enemies, but they are really only trying to threaten and intimidate their own people. Why? Because if we stopped hating each other, those hyper-nationalist hate groups would be out of business. There is no difference between Shiv Sena leader Sanjay Raut and Pakistani mouthpieces like Ahmed Quraishi. They even give the same statements, only wrapped in different flags. We should stop listening to all of them. Will PTI’s Money Trail Lead To Aabpara? Rumours have surrounded PTI since its miraculous rise from being essentially of party of one man to the second largest party over the course of a single term. Imran’s popularity has never been in doubt, of course. Actually, he is admired and respected for both his cricket career and equally his charity work even by many who are uncomfortable with his brand of quasi-religious hyper-nationalist politics. So even while he has been surrounded by rumours, they have rarely been about Imran Khan than about his party more generally. First Good Taliban, Bad Taliban. Now Good Drones, Bad Drones. Policy of distinguishing between ‘Good’ Taliban and ‘Bad’ Taliban is well known. This is denied by the state, of course, but actions speak louder than words and based on the actions of the state apparatus, many believe that, in the words of The Nation, “The government tells us there is no distinction between good and bad terrorists – it lies.” Now, another group has apparently been divided into ‘Good’ and ‘Bad’ camps: Drones. According to a new report including data compiled by Asian Human Rights Commission, 7,170 people were killed and 8,746 injured by violence in Pakistan since the last 11 months. 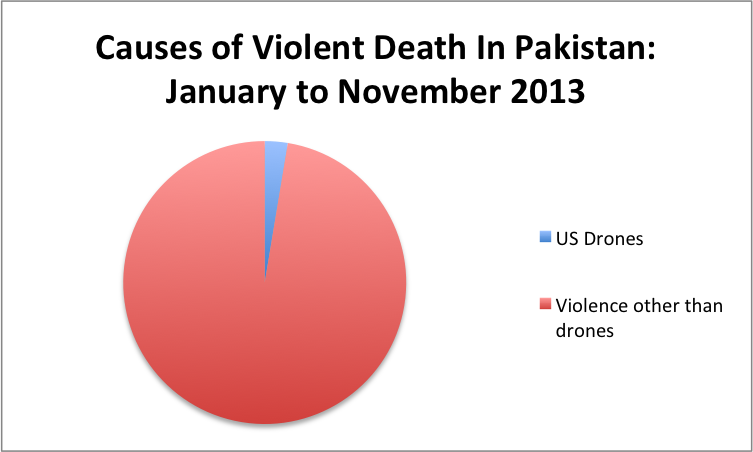 The total number of death by violence includes 188 people killed by drones. 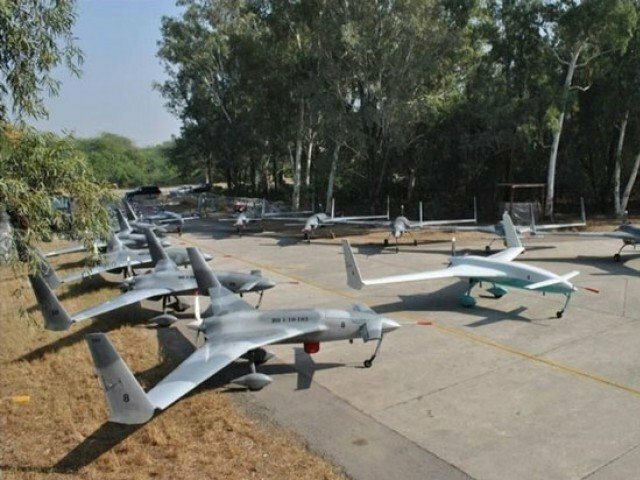 Despite accounting for less than 3 per cent of all violent deaths in Pakistan, however, drones continue to be the primary issue for protests. Leaving aside academic questions of international law and sovereignty for the purposes of this post, a question that deserve asking is why there is not a more prominent outcry for the 97 per cent who were not killed by drones. The incident at Salala in which NATO forces killed 24 Pakistani soldiers was termed as proof of American deviousness and a turning point in relations with the difficult ally. Whether the attack was deliberate, accidental, or the result of a plan by militants to draw American fire on the base as a means to ‘divide and conquer’ the alliance, it caused national outrage as people demanded justice. In response to the deadly attack, a group of religious parties and mullahs formed the Difa-e-Pakistan Council to advocate against allowing NATO supply routes through Pakistan and siding with the West in the war in Afghanistan. Eventually, the Americans apologised for the incident. But as I thought about those brave soldiers who embraced martyrdom defending their country, I couldn’t help but also think about another attack – one that happened just last week and killed 23 innocents. The attack last week was not carried out by NATO forces, but by Taliban. They did not carry out their attack along a porous border in the remote tribal areas, but in Rawalpindi, right under the nose of GHQ. And they did not target the security forces, but innocent women and children. A Taliban suicide bomber has struck a Shia Muslim procession near Pakistan’s capital, killing 23 people in the latest in a series of bombings targeting the sect during its holiest month of the year. The bomber attacked the procession around midnight on Wednesday in the city of Rawalpindi, next to the capital, Islamabad, said Deeba Shahnaz, a rescue official. At least 62 people were wounded by the blast, including six police officers. 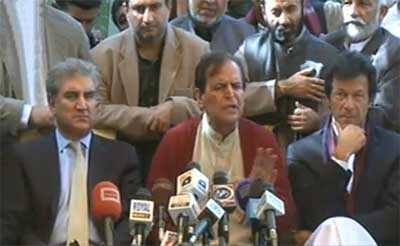 Eight of the dead and wounded were children, said Shahnaz. There can be no mistake about this attack. It was no accident, no case of mistaken identity. The attackers knew their target, admit their deed, and have vowed to continue to murder Shias until they are wiped from the Earth – also known as genocide. The Pakistan Taliban claimed responsibility for three attacks carried out on the eve of the D8 summit and said more would follow. “People belonging to Shia community are infidel and blasphemous and we will not spare them,” said a spokesman. Apologists often make excuses for these Pakistani Taliban by saying they are different from foreign Taliban fighting jihad ‘justified by Islamic law’. But the facts are stubborn things, and the facts are that these foreign jihadis have close relationships with the Pakistani Taliban who share their ultimate goals. The Islamic Movement of Uzbekistan (IMU), a militant group based in Pakistan’s tribal agencies, has suffered a series of major battlefield setbacks over the past year. But despite the loss of several senior leaders and a key media operative since 2011, the group remains one of the most militarily capable and media savvy militant outfits operating in the region. It maintains working relationships with a number of other Sunni militant groups active in the region including al-Qaeda Central, Tehreek-e-Taliban Pakistan (TTP), and the Afghan Taliban. The IMU has particularly close ties to the TTP, with whom it has launched joint military operations against Pakistani military targets inside Pakistan, as well ISAF and Afghan government targets in Afghanistan. In April, an estimated 150 IMU and TTP fighters launched a successful attack on Bannu Prison in northwestern Pakistan, freeing nearly 400 prisoners, including Adnan Rashid, who was convicted in 2008 of involvement in an assassination plot against then-Pakistani president Pervez Musharraf. Rashid was subsequently featured in videos released by the IMU and TTP. Thousands of people protested the re-opening of NATO supply routes in July led by clerics and religious parties who claimed to be acting in ‘defense of Pakistan’. Today, jihadi militants continue to murder innocents and where is ‘Difa-e-Pakistan’ now? If Pakistan is to survive, we must face the fact that we are being attacked from within. The foreign agents trying to destroy Pakistan are not invisible Raymond Davises, but the jihadi leaders holding conferences in our own capital. The foreign forces killing thousands of innocents are not CIA drones, but jihadi suicide bombers coming from Uzbekistan, Afghanistan, Tajikistan, and beyond. If we are truly patriots who want to defend our country, this is the enemy that we have to defend against. Otherwise, I fear we are lost.